Summary: The lesson plans available from Dole Archives Education are categorized into three tabs - KUCSS, STEM, and Document Discovery. KUCSS – Kansas University Council for the Social Studies – is an undergraduate education student group affiliated with the National Council for the Social Studies (NCSS). The Public Education Coordinator mentors students and assists on presentations at NCSS’s annual national conference. The KU students, in turn, produce high quality, peer- and teacher-reviewed lesson plans with classroom experience. STEM brings together environmental studies and archival research. This lesson plan unites Dole Archives and Library of Congress materials to produce a focused look at scientific patents and how they affect our everyday lives. Document Discovery contains materials used in outreach and on-site workshops taught by the Public Education Coordinator. New Digital Breakout available! 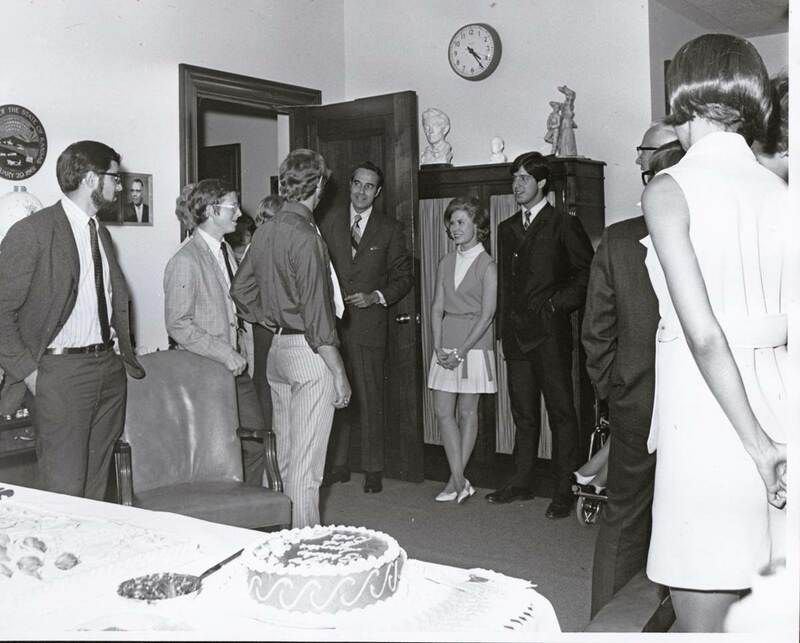 This breakout activity, similar to an escape room, provides background on Senator Dole, and an introduction to archives and primary sources. Break through the stacks door via a series of clues and riddles for a fun introduction to the Dole Archives. Need help using these files? Viewing: Click a thumbnail to view the item - it will open in a new window. Saving: To save the file, right-click the "Download" link below the item's description. Select "Save Link as..." Browse to where you would like to save the file on your computer and click "Save"
Description: These instructional materials include background on Senator Bob Dole’s life prior to and after his injury in WWII, which set the foundation for his later life as a public servant. Contributors: Audrey Coleman, Senior Archivist, Dole Institute of Politics. Acknowledgements: Thank you to Zach White, Social Studies Teacher at Greensburg High School in Greensburg, Kansas, for his feedback on the materials. Description: In this lesson, students will explore the meaning of bipartisanship through practice and critical thinking. In practice, students have the opportunity to challenge real life situations and decisions through the application of the Accessibility for Disabilities Act on the local and federal level. Contributors: Audrey Coleman, Senior Archivist, Dole Institute of Politics; Joe O’Brien, University of Kansas; Tina Ellsworth, University of Kansas. Acknowledgements: Thank you to Zach White, Social Studies Teacher at Greensburg High School in Greensburg, Kansas; and Mark Schiltz, Bonner Springs High School, Bonner Springs, Kansas for their feedback on the materials. Description: During this two day lesson students use primary sources to analyze arguments that were presented in 2012 when the U.S. Senate considered the Convention on the Rights of Persons with Disabilities (CRPD). In separate groups students first consider one argument in depth and then present each argument to their peers in a second group. The class then comes together to deliberate whether the U. S. should ratify the CRPD. This lesson helps students to understand the mechanisms for treaty ratification, as well as the consequences of ratifying the CRPD. Additionally, students practice valuable skills in document analysis and argumentation. Presented as part of the session, "Commemorate Social Justice: Bipartisanship and the ADA!" at the National Council for the Social Studies Annual Conference on November 14, 2015, in New Orleans, LA. Title: Government Food Programs Across Time: A Healthy Recipe for Equity and Peace? Description: This lesson plan is designed to introduce students to the idea of food and hunger’s role in inequality and the government’s ability to address inequality through food programs such as WIC, Food for Peace, Food Stamps, and School Lunches. Presented as part of the session, "When Liberty and Equality Collide: Discrimination within Equal Protection Clause?" at the National Council for the Social Studies Annual Conference on December 3, 2016 in Washington, D.C. Title: What’s the Problem with Patents? Description: This lesson plan was designed in class collaboration within a Library of Congress Teaching with Primary Sources grant. Overview: Patents are an integral part of American lives whether it is recognized or not. A brief history of patents via primary sources is related to public access to research findings and how this may affect ethics in the future. Analyze a variety of 20th century primary sources to scrutinize patents over time. Identify sources of discussion with patent laws and how they can be subject to bioethics. Debate in a professional manner about bioethics and how it relates to government legislation. Investigative Question: How have federally funded scientific innovations and patents enhanced the American public’s access to new technologies? Description: Infographic on the progression of problem to congressional involvement to government legislation that allowed federally funded research to be patented within universities and private laboratories. This law is credited with the explosive growth of biotechnology, leading to new drugs and treatments of diseases. Investigative Question: How does congressional legislation affect STEM research and the public? Description: Investigate an interesting photograph from the archives to analyze the clues that this picture holds. Use this photograph with young elementary children for an easy introduction into the Dole Archives or use with older students to examine their analysis skills. What time period does this event take place? Who do you think these people are? What are they doing? Always keep asking questions! Essential Question: What do you observe? What context clues help you decipher what is the setting for this photo? Description: This is a great introduction for younger students in primary source document analysis. This easy to read letter uses simple language and does not hit on heavy themes of war; a young Bob Dole is writing his parents while he is in training for the army during World War II. A good way to introduce typewriters, writing letters and time away from family. The public education coordinator uses this letter for 4th grade and above. Essential Question: What are some main points the author (a young Bob Dole) wants to tell his family? What about the fried chicken and ice cream? Description: This workshop provides an introduction to primary source analysis and how to decipher clues about significant documents from the Dole Archives, this example is from 1968 civil rights legislation. Students then transition to exploring primary sources from the internet, includes tutorial on how to search the Dole Archives online digitized collections and database. Recommended search terms are also over viewed to promote efficient and useful google searches in the midst of vast available information. Essential Question: What are the best practices when searching for useful primary sources? Description: A look at two 1969 constituent letters from the Dole Archives highlighting opposing views on whether 18-year-olds should have the right to vote in the United States. Essential Question: Should 18-year-olds have the right to vote and make decisions for our country? Description: The Americans with Disabilities Act was signed into law by President H.W. Bush on July 26, 1990. 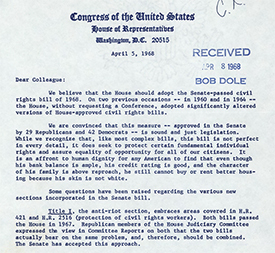 Four primary sources from the Dole Archives illustrate the process of government and address how community problems can lead to legislation. The Dole Personal Story and ADA Facts are part of the pro-ADA legislation side, and the other two documents, the Unfunded Mandate news article and the Vachon Memo, highlight opposition to the law. Comparing and contrasting these documents will prompt a class discussion. Hopefully students will understand that there is no wrong or right side, just different viewpoints on legislation and how to help people the most. Other document options are available! Essential Question: How has ADA affected lives? Is this issue complete yet?